HazCom labeling changes are here. OSHA’s new standards finally match GHS labeling. Expert Chuck Paulausky, CHMM, explains hazard communication labeling. Chuck says the new labels are a big safety improvement from previous systems. He explains the new rules, and their similarities to NFPA, GHS and HMIS labels. Dan Clark hosts the interview with Mr. Paulausky. In the discussion, they spotlight the conflict between the NFPA zero-to-four ranking, with four being the worst and the GHS classification numbers, four-to-zero ranking, with zero being the worst. Chuck consults industry on EPA and OSHA compliance. His company is CP Safety & Environmental based in Chandler, Arizona. Chuck Paulausky: How do you correlate the NFPA zero-to-four, with four being the worst with the GHS classification numbers where the lower the number, the worse it is. Dan Clark: New hazard communication labeling standards are coming June 1st, 2015. This means that chemicals must have a whole new labeling scheme. Some are confused and, in some cases, some are panicked. Hello, I’m Dan Clark. Today we’re talking with Chuck Paulausky, President and principal consultant for CP Safety & Environmental. Chuck is a Certified Hazardous Materials Manager and an OSHA authorized outreach trainer, and we’re talking with Chuck from his office in Chandler, Arizona. Hello Chuck! Chuck: How are you doing today? Dan: I’m doing well, thank you. So, this new hazard communication labeling standard comes in June 1st, 2015. Should company owners and safety managers be panicked? Chuck: Well, it depends on the situation. I think there’s a lot more pressure on the manufacturers of the chemicals to meet that June 1st deadline. For users of the chemicals, it’s a little different story because they were actually required to provide training on the new GHS labeling and safety data sheets for their employees as of December 1st, 2013. So, if they haven’t done that yet, then they’re kind of behind the eight ball. Dan: They’re already out of compliance. Dan: Exactly why are the standards changing? If you could review that, I know a lot of people in the industry understand what GHS is and all of that, but give us a thumbnail. Chuck: Well, basically, the issue comes out of the history of hazardous communication. There’s been a lot of problems for manufacturers of chemicals who wanted to ship chemicals to Belgium or Japan or other countries. If those countries had specific requirements for labeling and for safety data sheets, there were restrictions placed on those manufacturing companies. In Brazil,1992, there was a conference—a UN conference—they developed an international mandate to develop a harmonized system for classification, labeling and transport and for the safety data sheets. Out of this developed the Globally Harmonized System Of Classification And Labeling Of Chemicals. The short term for that is Globally Harmonized System—GHS. Chuck: This information is included in what’s called the purple book. It is, kind of, the manual that drives all of the requirements for labeling, the safety data sheets and all that. OSHA, finally, after a number of years in dealing with the situation, developed a rule. That rule was finalized and became effective on May 25th, 2012. Dan: But, I can’t believe this didn’t happen before with OSHA. Chuck: Yeah it’s surprising. And, like I say, a lot of the manufacturers were ahead of the game because they were trying to ship their chemicals to Europe or Asia and ran into this roadblock. Each continent, each country, kind of, had their own requirements, and so what GHS does is it puts everybody on the same footing. Dan: So is there actual difference between this hazard communication from OSHA and GHS? Is it exactly the same? Chuck: No. There are some significant differences, and this is where it creates a challenge for both manufacturers and the users of the chemicals. Essential differences include changes to the classification criteria. There are a number of different hazard classes now, and OSHA, in the past, relied, to some degree, on other groups. Ah, NFPA, for instance, and their approach to the definition of a flammable material. Chuck: And so the new classification criteria, kind of, brings everybody together. It was a challenge in the past because OSHA had its way, NFPA, all the different agencies and regulatory bodies, kind of, had their own approach to things and they don’t always jibe. So, under the new classification criteria—it’s very clearly defined in the purple book. There are health and environmental hazards, physical hazards, and mixtures. Each hazard class has different categories, and those categories are based on degree of severity, and they number them. The numbering is not always consistent from a toxicity hazard to a corrosive hazard, but, in general, the lower the hazard classification, the more dangerous the material is. When it comes to mixtures, if you have a chemical compound or chemical product that’s a mixture of things, it’s defined in the purple book and it’s based on a certain percentage of the chemical and how it contributes to that chemical product’s hazards. So, for instance, it’s a 0.1% content for any carcinogens requires that that be included in the hazard classification. For other hazards, generally, it’s 1%. The other changes include just general hazard communications, the labels. In the past it’s been, kind of, anybody’s best guess as far as what’s required on the labels. There were basic, general requirements. But under GHS, these are very specific what information needs to be there. And for the safety data sheets—what used to be called material safety data sheets, but apparently the rest of the world dropped, or has not used the word “material.” So we have adopted that. So we no longer call the information “material safety data sheets” or MSDSs, they’re now SDSs. The other factor that needs to be taken into consideration is the written programs. OSHA has always required a written hazard communication program that defines all the ways that you communicate hazards, how you manage safety data sheets, how the information is made available to the employees. It covers training, communication with outside contractors, that sort of thing. Those written programs essentially have not changed, but you do need to factor in the GHS elements, and also update your training to cover GHS. 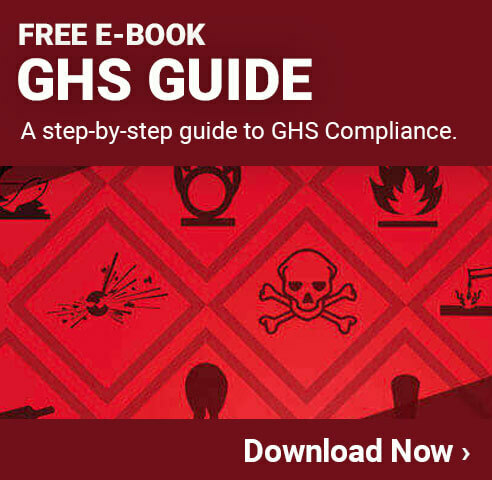 OSHA has also added some pre-existing hazard classes that were missing from GHS. Things that OSHA felt were important, and so when they adopted the GHS classifications in the US, they’ve added a few others. Asphyxiants, pyrophoric gases, ah, combustible dust. They’ve also included—because there are other hazards that are not clearly defined and are certainly not defined under the GHS classifications—they’ve included what’s called HNOC, “hazards not otherwise classified.” kind of a catchall. And that’s to cover pre-existing hazards that don’t meet GHS specification. Dan: On Jeopardy they call that Potpourri, but go ahead (laughs). Dan: Okay, well it sounds like it’s not quite perfect, to say the least. But, would you say that it’s better than the labeling standards from 1994? Chuck: I like a lot. I like the approach that’s being taken. In the past when I had to get information on a chemical, I would go to the safety data sheet. For years I have battled that challenge of getting the information I needed from the safety data sheet, because the requirements for the information from OSHA was a little vague. They gave a general outline of what information should be included. They didn’t specify a format for the safety data sheet. They simply made a suggestion. Their suggested format was eight sections. But, for years, I’ve gotten safety data sheets that I’ve had to go through and try to find the information that wasn’t in an order. Sometimes they had eight sections, sometimes they had 10 sections. Sometimes there were no definable sections. It was all over the place. And the information that was there was not always as accurate or descriptive as I needed. And, there were even cases where I found chemicals identified by CAS number, ah—chemical abstract system numbers—that were incorrect. And I had to go back to the manufacturer and point out to them that their safety data sheet was wrong. Chuck: So, you know, it was just all over the place. And—under the new standards—very specific requirements for the safety data sheets. 16 sections, each section is clearly defined in the purple book and says exactly what’s supposed to be there. So as long as the manufacturer meets those requirements—around the safety data sheets he sends out or makes available for those chemicals—that’s great for me because I know I can get what I need and I’ve got a pretty good idea where I’m going to find it. Dan: Well that’s great. I’m glad to see that there’s improvement in that. But, I have to ask you, you mentioned the NFPA labels. Dan: …the labeling? The new HazCom and the NFPA labels. Chuck: Yeah, ah, and that’s a little bit of the challenge. When OSHA proposed their standard, there are actually two groups that are responsible for two different labeling systems. NFPA is one. The NFPA diamond. And then there’s the Hazardous Materials Information System, HMIS, which uses the color bars. So it’s essentially the same information with the exception of the white bar on HMIS. Under NFPA, the white part of the diamond refers to special hazards. and these are things that are obviously focused on the protection of firefighters. Chuck: That’s where the NFPA thing came from. HMIS is more focused on employee safety and so, instead of special hazards under the white bar, they include personal protective equipment requirements. So, the trick here is that both of those systems are based on a zero-to-four rating, with four being the worst. Chuck: The challenge, then, becomes how do you correlate the NFPA zero-to-four, with four being the worst with the GHS classification numbers where the lower the number, the worse it is. Dan: The analogy for me is the hot dog bun makers make them eight in a pack, but the hotdogs come ten to a pack. Now, does that make any sense? No. Dan: So how could they possibly have made this where one labeling standard, it’s incrementally going up, and the other is going down? Chuck: And OSHA’s basic response was “Eh, won’t be a problem” because the GHS class information is only required on the safety data sheet. It’s not required on labels. And NFPA and HMIS labels are, for the most part, just that. So, OSHA said “It won’t be a problem.” You know, we’re still waiting to see how that pans out. It happened because the GHS approach, generally, has been a long-standing, widely accepted throughout the rest of the world in various ways. But, it was always that numbering system with the lower number being worse. So the rest of the world is not going to change just because two little organizations in the US use the opposite approach. And so the NFPA and HMIS labels, again, are widely accepted here in the US. They’ve been trained for years. The employees recognize them. Fire departments recognize them. So, those aren’t going to change. Chuck: So, it’s just something that we have to deal with. Dan: Yeah, well, the rest of the world’s Celsius and we’re Fahrenheit, and that’s just the way it’s going to be. Chuck: Exactly. Exactly. The trick, then, is to educate the employees to recognize the difference between the NFPA and HMIS codes, that are on the labels and, probably, hopefully, on the safety data sheets as well. And to recognize the difference between those and the GHS classifications when they see them on the safety data sheet, so there’s no confusion. Dan: Okay. Well, do you expect, Chuck, that the NFPA and HIMS labels will stay the same? Chuck: Those are not likely to change. You’re probably not going to see changes to the NFPA labels, ah, placards that are often required on the outside of buildings for the purpose of warning firefighters of what’s inside the building. OSHA will continue to require labels on all chemical containers and tanks, whether they’re from outside or used in the workplace. Chuck: But, they have to be either labeled with the shipping label, which now will be GHS, or at least the following information: product identifier and a combination of words / picture / symbols that provide at least general hazard information. OSHA doesn’t require NFPA or HMIS labels, but those labels will meet that general requirement for words / picture / symbols. So, NFPA and HMIS labels, I think, are a good option for that labeling requirement. A chemical can have the GHS label on it and the information on that shouldn’t conflict with the NFPA or HMIS labels that the user chooses to apply. Dan: Do they also have to label them just as the chemical manufacturers do? Chuck: …unless there are obviously DOT labels required, as well. But for those chemicals to be received by me they probably will have all the labeling they’re needed. If you are repackaging a chemical, yes, you will need to have a GHS compliant label on it and should be accompanied by a GHS compliant safety data sheet when it goes out. Dan: I wonder, Chuck, how picky OSHA is going to be. It seems like they could regulate pens, and pencils and office environment stuff like, ah, copy machines. Dan: Do you think they’ll nitpick? Chuck: OSHA has never really required that kind of information on certain types of products like pens, pencils, adhesive tape, stuff like that. There’s not going to be a requirement. Those are going to be exempt under HazCom. Chuck: OSHA’s concern is “Are employees exposed to significant hazardous chemicals in the workplace?” Let’s take an example: copy toner. Chuck: OSHA has previously stated that intermittent or occasional use of the copy machine is not covered under the rule. Because they’re really not significantly exposed. Chuck: …or to operate, or it’s operated for long periods of time. If you get one person who is devoted to operating the copier, there may be a need for that. Chuck: And most any product that is manufactured that contains chemicals, let’s say, ah, it’s likely that you can get a safety data sheet for it. It doesn’t necessarily mean you have to have that on-site. You know, there are things like janitorial supplies. Ah, do you need to have a safety data sheet for janitorial supplies? Well, you know, it’s being used as it’s designed. You’ve got a can of Windex, that’s one thing. But if a janitor is using large quantities of Windex, or a window washer is using large quantities, that’s a significant exposure. Dan: Sure, especially if it’s a concentrated chemical that they have to dilute. Chuck: So, the quantity and the level of exposure’s going to drive that. Chuck: Generally, for consumer products, not so much. Dan: Okay. We have the world’s oldest copying machine here, and, you know, it always jams up. So, I guess, what I’m going to need to use is, ah, rubber gloves and a respirator when I go to fix the copy machine. Chuck: (laughs) It all comes down to your exposure. Dan: Yeah. Well, Chuck, let’s get right down to the labels themselves and what they look like. Dan: The new scheme. Do they have to be multicolored? Chuck: The GHS pictograms that are required on the shipping labels are designed with red borders and black images. Chuck: OSHA and GHS require these to be in color because they’re more recognizable. So, if you’re going to ship something with a GHS compliant label those aspects of the label have to be in color. Dan: …but could we go through some of these? And I’ll describe the image and you tell us what it means. Dan: Is that the same meaning? Chuck: Pretty much, pretty much. Chuck: Those pictograms come right out of the purple book, and each pictogram is connected to specific hazard classifications. Chuck: It will also tell you what signal words might be required, what hazard statements, precautionary statements. All those things are linked to those hazard classifications. For toxicity, the skull and cross bones—and we’re not talking ARRG, you know, as in pirates—it meets certain toxicity classifications under GHS. Dan: Okay. Now, I see the exploding bomb in one of these. What does that mean? Chuck: The exploding bomb is going to refer to, ah, obviously, exploding materials, ah, strongly reactive materials, certain hazard classes related to those categories in the classification. Dan: Okay. Now, there are two diamonds that have flame. One is just a single flame, and then one is a flame over a circle. Chuck: Flammability is the flame. Chuck: And the level of flammability depends on the flashpoint, primarily. The image with the flame and “O” is basically oxidizers. Chemicals that generate oxygen and can cause a fire to burn hotter and longer. Dan: At creativesafetypublishing.com. And they can get a good view of those. Dan: We’re getting close to the end here I do want you to give us a quick overview of what you do with CP Safety & Environmental. Chuck: Okay. I’ve been doing safety and environmental since 1989. I worked quite a few years as environmental health and safety manager for a number of different companies. The last company, I was manager of facilities in, ah, let’s see, Arizona, Texas, California, Scotland, France, Singapore, and Taiwan. Chuck: Safety teams—I’m a big fan of safety teams—I couldn’t have done what I did for that company without them. For the last 12 years or so, I started my own company, and that’s, pretty much, what I’ve been doing. And, and very much the same thing. It’s just working as an outside consultant. Chuck: Anything environmental health and safety. Dan: Well, it sounds like you’re a busy man, but I know that you do consult for private companies, so go ahead, if people want to get a hold of you, what’s your website? Chuck: Ah, my website is CPsafety.net. And I’m located Chandler, but I currently have a client in Seattle right now, and I’ve had one for several years out in Houston, so I’m not afraid to travel. Chuck: Well, I don’t know, my wife, my wife seems to appreciate my time away. Dan: (laughs) Well, I’m glad that you have a labor of love, ah, with this industry that you’ve chosen. Any final thoughts, Chuck, on hazard communication and this June 1st, 2015 labeling deadline? Chuck: Yeah, it’s ah, you know, as far as those deadlines, I should mention the employees were required to be trained on the new systems by December 1st, 2013, so if you haven’t done that you should to get on the stick on that one. Chuck: By June 1st, 2016, companies are required to have their workplace labels updated, the HazCom program updated, completed all training. So, you’ve got a little bit of time there. It’s for the manufacturers that that June 1st, 2015 deadline applies. And they’re required by that date to comply with all provisions of rule, except that they can continue to ship under the old system until December 1st, 2015. So, there’s some leeway there. So, manufacturers, you should be requiring from your suppliers GHS compliant labeling and safety data sheets no later than 2015. And then you’ve got a little bit of time to get your program together, but I wouldn’t waste any time. I’d get on it now because your employees probably already have been seeing safety data sheets that are GHS compliant, and if you haven’t done the training, they may not get it. Dan: What I’ll do is, in the transcript of this podcast, I will put the links to the actual deadline dates that you just rolled out. About June 1st, 2015; ah, June 1st, 2016 and the previous deadlines and what’s required. Chuck: Right. And if anybody needs any help, just have them give me a call. Dan: Okay, that’s great. Well, Chuck, ah, we really appreciate you being on the podcast today. Thanks very much. Chuck: I appreciate the opportunity. Dan: Our guest has been Chuck Paulausky, President and principal consultant for CP Safety & Environmental in Chandler, Arizona. Thanks for joining us I’m Dan Clark. chemical drums image © ℗ 2010 Geoffrey Whiteway, Copyright © 2005-2013 freerangestock.com. All Rights Reserved.